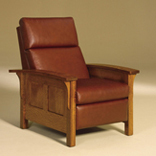 The Balboa Recliner reveals its hardwood construction with exposed sides. The legs are carefully carved, while the sides boast arched base skirts and paddle sides with curved edges. To complete this interesting piece are arm rests steam-bent to a perfectly comfortable curve. The Barrington sofa accommodates two recliners for a comfortable yet practical seating solution. Pictured in qs white oak with Michael's Cherry stain. With Ravenwing Black Ultra Leather upholstery and Black Tupelo Inlays. 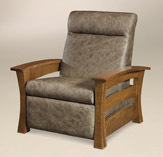 Our Caledonia chair is pictured in brown maple with FC7992 Asbury stain and A3195 Chrome fabric. 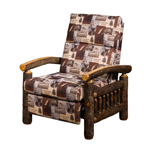 An Amish made recliner provides the perfect spot to enjoy your favorite movie or relax with friends and family. 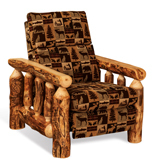 The pictured Fireside Rustic Recliner is built in aspen with natural finish and Mealey Fabric. This fully reclining chair is a comfortable place to steal an afternoon nap. 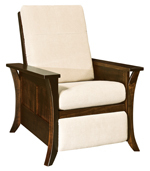 The frames are styled with curved arm rests and corbels around hard wood panels to create a beautiful chair that is also an heirloom. Cushion springs are standard for maximum comfort. Frames feature mortise and tenon construction for long lasting durability. Contact us if you would like to provide your own upholstery material. 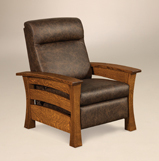 This comfortable chair fully reclines and rests your whole body. 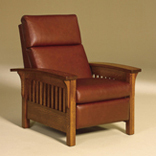 With stylish slats, a sturdy frame, and upholstery of your choosing, this recliner can become your favorite chair for decades. Cushion springs are standard for maximum comfort. Contact us if you would like to provide your own upholstery material. Frames feature mortise and tenon construction for long lasting durability. 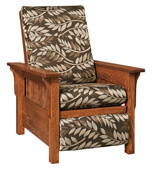 Pictured in qs white oak with Michael's Cherry stain and 26-10 Cornelia Brown fabric.